Home » How To » How to Exchange Bitcoin with Altcoins on Changelly with Credit Card? Bitcoin is the really good investment for the people looking for some financial profits. As the value of the Bitcoin has been increasing since the time of its evolution, most of the experts recommend investing in Bitcoins. Even Bill Gates openly endorsed Bitcoin. However, apart from the Bitcoin, there are also many other cryptocurrencies including Litecoin, Ethereum, Zcash, Dash etc. that are also wiser to invest in. Even people who have invested in Bitcoins only are considering to invest in these forms of crypto as well. So if you are looking for the same and want to exchange your Bitcoin with other cryptocurrencies, we have got you covered. Exchanging cryptocurrency have never been that easy before. But with the introduction of Changelly, this exchange is a fully fledged platform that let you convert any cryptocurrency into others. For example, if you want to exchange your Bitcoin to any other cryptocurrency like Ethereum, you can do it easily using Changelly Crypto Exchange. Wondering how you can do this? Here’s how to get started. So the first step in exchanging your Bitcoin to another form of cryptocurrency is visiting the official website of Changelly. There, you have to create your login ID so that you can easily exchange your any type of cryptocurrency into other forms. The Changelly will automatically generate the password for your login and will send it your email that you will add in the details. From there you have to get your generated password and login to the Changelly account. After getting logged in, follow these steps to convert your Bitcoins to other cryptos. Select the amount of Bitcoin you want to exchange and the form of crypto that you want as shown in the image below. Then, click on the Exchange button and you will be prompted to the next page where all the transaction details will be mentioned. From the next page, you will have to check the amounts and the transfer details. After confirming everything, Click on the “Next” Button to proceed. On the next page, you will find the details of the conversion you are making. 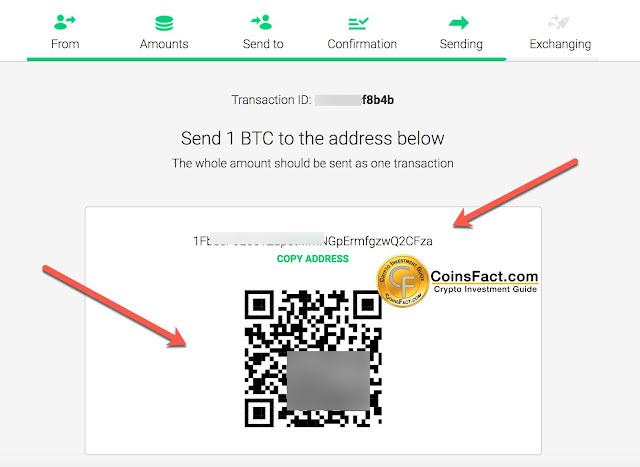 You will be asked to enter the address of your wallet into which you are exchanging your Bitcoin. Again click “Next” button to proceed. On the next page, you will see the QR code. Confirm the code. After sending the payment, you can close the tab as you will get email notification when everything is done. Now you are good to go. Exchange everything using Changelly.